One of the most difficult things to do in the modern age is eat well. That's especially true for the younger set. Now the healthy habits group Nourish Our Kids (NOK) wants to do a little something about it. Founded by holistic health counselor Donna Terjesen, NOK seeks to educate kids (not that adults couldn't pick up a few things either) about healthy eating and avoiding much of the junk that sits on grocery stores in general. Statistics show that children can achieve long-term health benefits by intervening early in their lives and exposing them to healthy lifestyle practices. Nourish Our Kids uses its healthy peer-role model characters, The NOK Rockers, in their storybooks, music, games, and healthy life-style school curriculums targeting young children ages 4-7 years old. The NOK characters, along with simple age appropriate teaching techniques, are used in tandem to coach children how to make healthy lifestyle choices and decisions on their own. 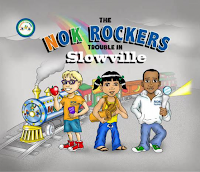 Their new book, The NOK Rockers: Trouble in Slowville, is their first adventure in health. Join 'em as they try to wake up a bunch lazy's and dethrone town bully- the Junk Food Jammer. 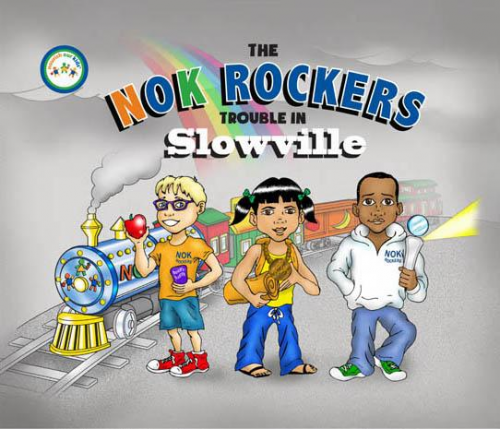 You can join the NOK Rockers on their first nutritional adventure to the troubled town of Slowville, where everything is black and white and the people are slow and sleepy. Together, The NOK Rockers, Saranna, Isaiah, and James, with the help of their guide and friend Zoe, must solve the mystery of this town’s colorlessness, all while being thwarted by the town bully, Junk Food Jammer. Can the NOK Rockers find a way to stand up to Junk Food Jammer and transform the town into a kaleidoscope of color once again? Or will Junk Food Jammer rule Slowville forever? You can order the book right here, or here. There's also a bunch of stuff to do on the NOK website and there's an App incoming to play around with as well. Sounds like a fun time for the kids and, lets be honest, that train is absolutely awesome.